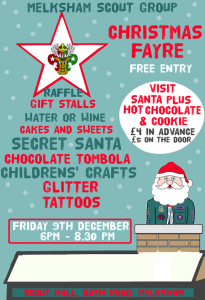 Come along and visit the Christmas Fayre, on Friday the 9th December from 6pm to 8:30pm. We have a range of stalls and games and fun activities. You can even visit Santa and enjoy a hot chocolate and a cookie. This entry is filed under Latest News and tagged 2016, December, Fundraising.